I make a lot of dishes that go well with rice at home, and I often thought serving white rice from rice cooker when I have guest is a little too boring. Thus this beautiful fragrant snow pea rice is often my choice to go on dining table. I love the contrast of colour, the light seasoning that will not overtake tastes of my main dishes, it could literally be made under 20 minutes! 1. Washed and soaked Basmati rice for 10 minutes，if Thai Jasmine rice being used, no soaking required. 2. In a heavy bottom cooker, heat up butter and vegetable oil at medium heat, add bay leaves, cinnamon stick, cloves and cardamom seeds, stir to bring out aroma of all spices, add cumin seeds, stir for 30-45 seconds, add drained rice and cook for few minutes until water evaporated and the rice look somewhat translucent. 3. Pour in 3 1/2 cups of water （for softer rice, use 4 cups minus 1 tbsp of water）season with salt，you could season it slightly saltier than what you may want it to be at this moment, as the rice get cooked, the saltiness will reduce. 4. Bring to boil, and turn the heat to medium, cook for 10 minutes, turn the heat to low and simmer for another 5 minutes. 5. Turn off the heat, and loosen the rice using a spatula or fork, sprinkle frozen peas evenly over rice, cover with lid and let it sit for 5 minutes. The remaining heat of rice will thaw and cook the peas nicely, at the same time retain the shiny green and sweetness of peas. 6. 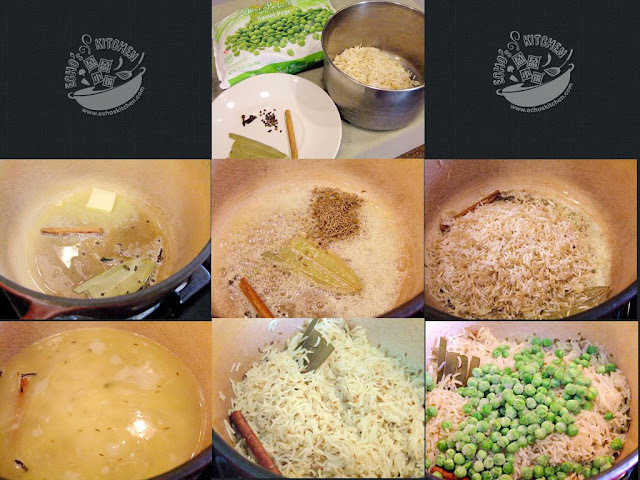 Mix the peas and rice together before serving. The rice should be fluffy and soft. I made this to go with my signature Lemongrass Chicken ! They are the best combo! The only one I've ever made is Mushroom Pulao and not anymore. Need to soak up more recipes. Wendy，yeah... I love rice.. and am a bit rice person... so will do more of pulao dishes for sure!